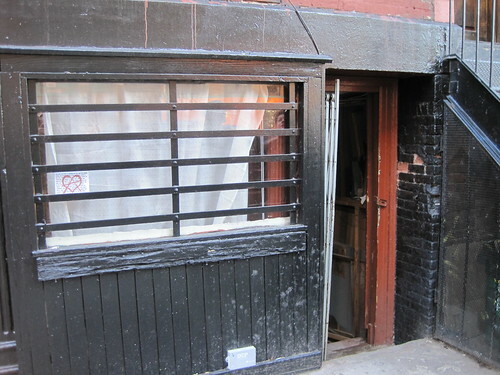 The Horse Auction Mart isn’t the only local building garnering recognition from historians – a storefront on East First Street that once housed “the most famous radical center in New York,” according to Emma Goldman, will be in the spotlight later this month. On May 30, the Greenwich Village Society for Historic Preservation will present a plaque commemorating the history of 50 East First Street, between First and Second Avenues. As The Local has reported, the ground-floor space – which recently got Fantom, a photography magazine, as a tenant – once housed Justus Schwab’s Saloon. 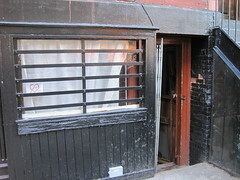 The drinks den was an “important meeting place for like-minded radicals of the day, including anarchist Emma Goldman and writer Ambrose Bierce, many of whom used the saloon as their mailing address,” according to a letter from the G.V.S.H.P. An invite to the 6 p.m. ceremony indicates that Two Boots will provide refreshments and entertainment, and “Emma Goldman” herself will make an appearance. Jared Malsin 50 East First Street. During the turn of the 20th century, 50 East First Street was the home of Justus Schwab’s saloon. Just 8-foot wide by 30-foot deep, it was described as a “bier-höhle” (or “beer-cave”), a pun on “bierhalle.” Though small in size, the tavern was a “mecca for French Communards, Spanish and Italian refugees, Russian politicals, and German socialists and anarchists who had escaped the iron heel of Bismarck,” according to Goldman, who spent so much time there that she had her mail sent there.